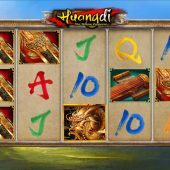 Huangdi The Yellow Emperor slot is a Microgaming edition based on the same mechanics as their Ariana game. There are 25 paylines over 5 reels and the theme is self-explanatory. 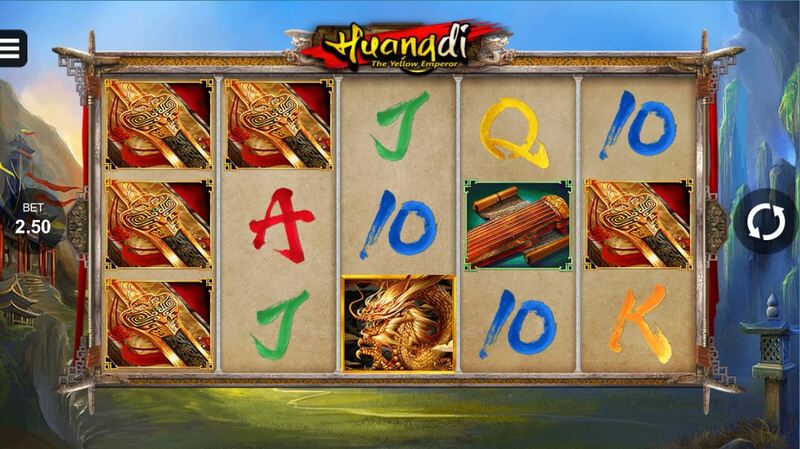 Huangdi appears stacked on the reels and they pay 8x stake for 5-of-a-kind. The rest of the premium symbols are stacked too including the chests and swords. The remaining symbols are single card ones. In case you were wondering where the developer got their inspiration for this game from, Huangdi The Yellow Emperor was the most ancient of the five legendary emperors according to this article. Little did this emperor know that he would be immortalized in a cloned slot - his ancestors must be so proud! The game is overlaid by the predictable Oriental - style music inferring drama and power from the ancient Chinese era. The Emperor does have a gift for his followers in that any stacked premium symbol landing on reel one, if creating a win, will make all similar symbols expand on the rest of the reels. So if the Emperor himself should appear on reel one in full, with single ones on the remaining reels you would end up with a full screen. There are single Wilds on all the reels but they don't expand so in the above scenario say one landed on reel 5 in place of the Emperor, you would have 4 full reels of Emperors and one Wild on reel 5, thus awarding 7 or 8 5-of-a-kinds instead. If you are fortunate and land 3 Golden Dragon scatters anywhere, you are awarded 15 free spins which can retrigger. The enhancement is that now you can get the Wild stacked on reel 1 as well as the premium symbols therefore it can trigger the expansion feature too if a win results. the Emperor's largesse hasn't finished yet, because unlike in the base game the single Wild on reels 2 to 5 will also expand as well as the single symbols, if forming a winning combination. It is not uncommon therefore to see full screens!